SoftPlanet makes it possible for everyone to get free Mp3 Volumer download directly from our servers. There is no registration needed for downloading. Did you happen to download new MP3 and the song to be too quiet or too loud, with low quality, or too big? If the answer is “Yes!”, then MP3 Volumer is the free program, that can solve all those issues for you. With the ability to increase the volume to 600%, this app can really increase how any song sounds, which can rid you from the annoying changes in the volume, while playing albums or whole selections of songs, as MP3 Volumer can increase all their sound at once with one very quick formatting process. While its best function is to change the level of the sound of the songs, the MP3 Volumer can also use almost any music format, making the program quite flexible. 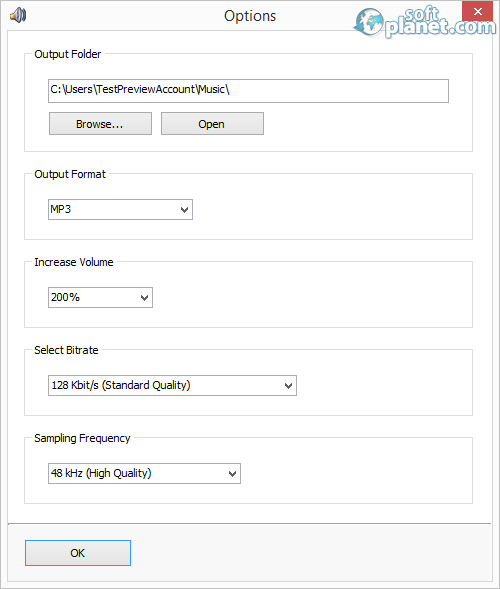 The output format can be set to be MP3, MP2, WAV, WMA, OGG, FLAC and AC3, which means, that this small app can be used even for your main converter, although it lacks MP4 format and the function of drag and drop is disabled in the program. 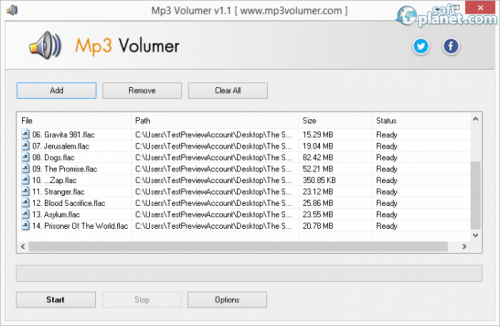 There are very few things you can do with MP3 Volumer 1.1, but its main function is very clear and its poor interface suggests that. You just need to add the music you want to be converted, after the output folder is selected, and to operate the program you need just three buttons - “Start”, “Stop” and “Options”. When the formatting process starts, you can continue doing whatever you want on your computer, as the program will notify you with a sound when it's ready. The process is very quick, and even quicker, if it's made with lower quality music. 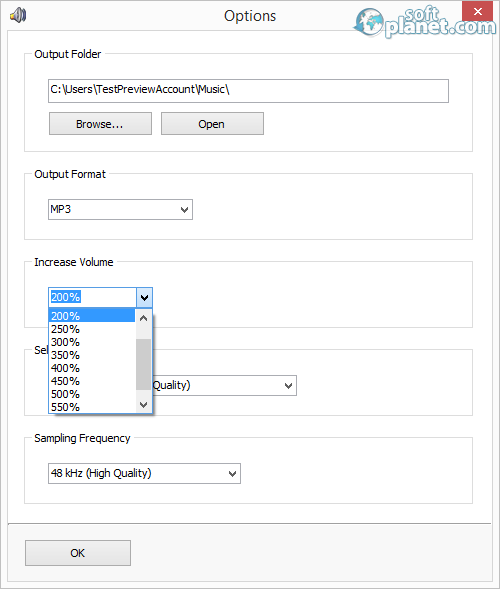 There are other options, which are available with MP3 Volumer, as it can change the bit rate from 90 kbit/sec, which is very low quality, to 320 kbit/sec, which is regarded by the program as insane quality. Also there are six available bit-rate levels. In the same time, there are just three standards for sampling frequency, ranging from the low quality 32 kHz to the high quality of 48 kHz. MP3 Volumer is really simple software, which seems to be its strongest advantage. However it doesn't mean that you don't get great performance. Quite the contrary! It is one of the easiest to use apps for music fans, we have tested for a while. Please feel free to share your observations with us regarding this software. Our security scan shows that Mp3 Volumer is clean from viruses. The current version of Mp3 Volumer has been scanned by our system, which contains 46 different anti-virus algorithms. That ensures that Mp3 Volumer 1.3.0.0 is 100% safe for your computer.